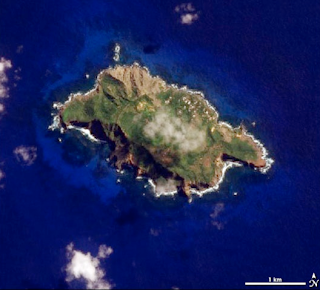 The Pitcairn Islands group is officially titled the Pitcairn, Henderson, Ducie and Oeno Islands. The 4 volcanic are famous for being the final destination of the mutineers from HMS Bounty. The families that still reside on the islands still carry the names of the mutineers. The initial inhabitants of the islands where Polynesians, however, when the first Europeans arrived, the islands where uninhabited. It is believed that the Spanish first sighted them in 1606, however, it was the sloop, HMS Swallow that more accurately plotted the islands in 1767. 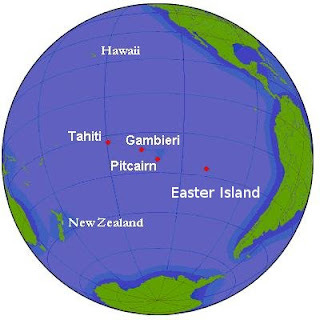 The islands where named for Robert Pitcairn. The midshipman who first sighted the islands. After casting Captain Bligh and his supporters adrift in one of the ships boats, the mutineers on board the Bounty sailed off with their Tahitian companions. Some of whom may have been kidnapped. Eventually they settled on the remote and relatively inaccessible island of Pitcairn. After landing, they burnt the ship, which can still be seen underwater in Bounty Bay. The islanders saw their first ship in 1795, and it was not until 1808 that a ship actually arrived at the island, and landed. A report was forwarded back to the Admiralty in London. The islands finally became a British colony in 1838, and in 1850, became one of the first places on earth to grant women the right to vote. In 1856, the islands population had grown to almost unsupportable levels, and led to the islanders requesting assistance in migrating. The British government ferried nearly 200 to Norfolk Island. Only for about half that group to eventually make its way back to Pitcairn. The islands themselves are very fertile, but largely incapable of supporting life given how inaccessible they are. 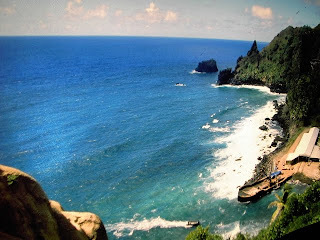 The only access available is to the main island of Pitcairn. The island features jagged cliffs and is far too mountainous to allow for the construction of a proper sea port, or air strip. The only access is from a small jetty from where the islanders launch long boats. It is also the only way ships can deliver tourists and goods, via this one small jetty. The largest island, Henderson, has rich natural deposits. But again, with it being a volcanic uprising, it is far too steep, and features jagged cliffs making landing on the island too difficult for anything larger than the islanders longboat! 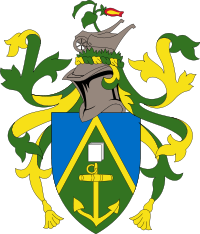 The Pitcairn islands finally approved its coat of arms in 1969, which features a green triangle set against blue. Representing the islands rising from the sea. Over the shield are representations of the anchor of the Bounty, as well as a copy of the bible. A very important book for the island. Taken from the Bounty, it helped the islanders create a peaceful society. Initially the island was rife with violence and alcoholism, and using the bible helped them turn away. The helmet and crest is made up of a flowering slip of Miro, and a Pitcairn wheelbarrow. The Islands adopted its flag in 1984. Initially a British ensign with the coat of arms on the fly placed inside a white disc. Later the disc was removed, and the coat of arms enlarged. The Pitcairn Islands is listed as one of the smallest democracies in the world!